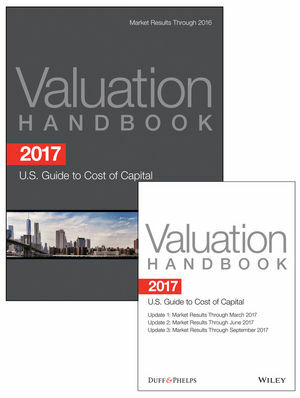 2017 Valuation Handbook – U.S. Guide to Cost of Capital provides the key annual valuation data previously published in (i) the now discontinued Morningstar/Ibbotson SBBI Valuation Yearbook (discontinued in 2013), and (ii) the Duff & Phelps Risk Premium Report Study (no longer published as a stand-alone publication). The size premia data previously published in the SBBI Valuation Yearbook is referred to as the "CRSP Deciles Size Premia" exhibits in the new 2017 Valuation Handbook – U.S. Guide to Cost of Capital, while the size and risk premia data published in the Duff & Phelps Risk Premium Report Study has been published annually since 1996 and, like the former SBBI Valuation Yearbook, provides data and methodology that can be used to develop cost of equity capital estimates using (i) the build-up method and (ii) the capital asset pricing model (CAPM). The 2017 Valuation Handbook – U.S. Guide to Cost of Capital includes data through December 31, 2016, and is intended to be used for 2017 valuation dates. The accompanying PDF Updates refresh industry risk premia and betas from the 2017 Valuation Handbook – U.S. Guide to Cost of Capital on a quarterly basis with data through March, June, and September 2017 for a full year of coverage. For more information about Duff & Phelps valuation data resources published by Wiley, please visit www.wiley.com/go/valuationhandbooks. Key cost of capital inputs: The 2017 Valuation Handbook – U.S. Guide to Cost of Capital provides the key inputs needed for developing the cost of equity capital (i.e., "discount rate") for use in estimating the value of a subject business, business ownership interest, security, or intangible asset. Inputs provided include: equity risk premia, size premia, risk premia over the risk-free rate, full-information industry betas, industry risk premia, and the risk-free rate. 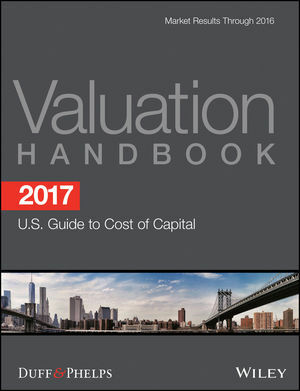 Discussion of topics that come up most when performing valuation analysis: The 2017 Valuation Handbook – U.S. Guide to Cost of Capital includes straightforward discussions about: (i) valuation theory, (ii) the differences between the various cost of capital estimation models (build-up, CAPM, Fama-French), (iii) understanding the basic building blocks of cost of equity capital (the risk-free rate, the equity risk premium, the size premium, beta, the industry risk premium, the company-specific risk premium), (iv) whether to "normalize" risk-free rates or not), (v) a detailed comparison of the CRSP Deciles Size Premia Study (the former SBBI Valuation Yearbook data) and the Risk Premium Report Study, and more. Easy-to-follow examples: The 2017 Valuation Handbook – U.S. Guide to Cost of Capital is packed with easy-to-understand examples for properly using the data to develop levered, unlevered, and even "high-financial-risk" cost of equity capital estimates using various build-up methods and CAPM. Roger J. Grabowski is a managing director with Duff & Phelps. He is coauthor of Cost of Capital – Applications and Examples, Fifth Edition, The Lawyer's Guide to Cost of Capital, and Cost of Capital in Litigation. James P. Harrington is a director at Duff & Phelps. He is a leading contributor to Duff & Phelps' efforts in the development of studies, surveys, online content and tools, firm-wide valuation models, data distribution platforms, and published thought leadership. He is a coauthor of the Duff & Phelps "Valuation Handbook" series, a contributing author to Cost of Capital – Applications and Examples, Fifth Edition, and a Duff & Phelps contributor to the Stocks, Bonds, Bills, and Inflation (SBBI) Yearbook. Carla S. Nunes is a managing director in the Office of Professional Practice at Duff & Phelps, where she provides firm-wide technical guidance on a variety of valuation, financial reporting, and tax issues, with a particular focus on cost of capital. She is a coauthor of the Duff & Phelps "Valuation Handbook" series and a contributing author to Cost of Capital – Applications and Examples, Fifth Edition.